This translation, by Alexander Jacob, of Gottfried Feder‘s 1919 Manifesto against usury, is the first of an important set of English editions of Feder‘s works that will be published by the World View Foundations and the Historical Review Press. 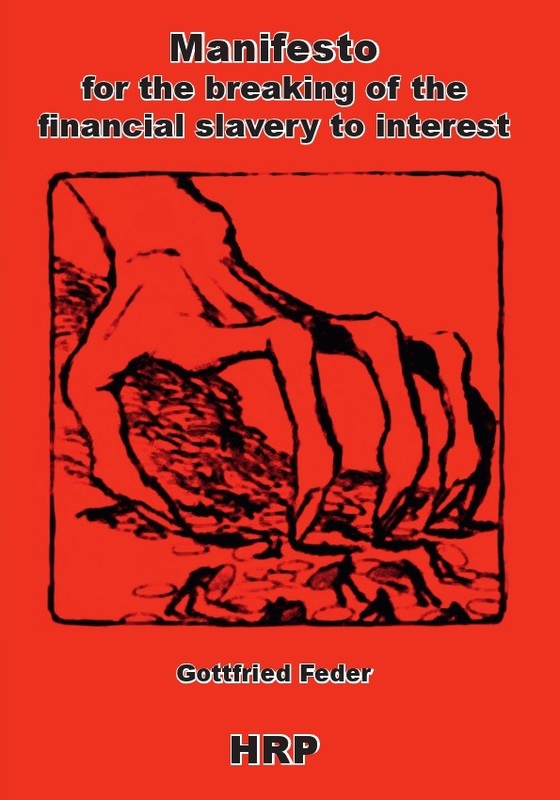 Feder‘s manifesto, written during Germany‘s dark days following the first World War, remains a crucial document in the history of economic theory on account of its focussed attack on interest as the source of the evils of international high finance. Feder‘s fight against “Mammonism” - which he defines as “a frame of mind that has taken control of the widest sphere of nations, the insatiable greed for acquisition, the life-view which is purely oriented to the his-worldly that has already led, and must lead further, to a frightful lowering of all moral conceptions” - is endowed with a special significance today when the economic collapse of financial institutions and even states in the West is symptomatic of a more alarming,“globalised”, disintegration of public morality and culture.